_ _ As I’ve mentioned (read: whined about) before, being in my mid-twenties I feel that although I’m starting to find some direction, I’m still having trouble pinpointing what exactly I want to do with my life. Since the time I began writing, I’ve always been able to take scenarios and imagine them with great precision, and I became better and better at putting these images into words… but I have yet to write a story with a satisfactory ending; I can set the scene, but when it comes to driving the tale with a plot, I’m at a loss. He stumbled outside, catching his sneaker on the lip of the step. Turning back he glanced into the smoky darkness. A red light pulsed somewhere in a back room. The only moving figure was a man slouched over the counter turning his head to mumble a slurred query at the sudden fresh air let in by the door now swinging shut. As the rusted tumblers fell back into place he finally withdrew and took in his surroundings. The alley he now faced was little different than the scene he’d been part of inside; the smell of years of garbage permeated the area and empty cans of cheap beer littered the ground. Only the slight rise and fall of what appeared to be a pile of newspapers indicated another living being might be present. He looked around feverishly pausing after every turn of his head, waiting for his vision to shiver back into place. No one could have seen him exit. The old surveillance camera that had been mounted atop the building countless years ago had a dirty white tee shirt thrown over its lens, yellow stains circled the underarms and spread partly onto the chest; he wondered briefly what its owner hadn’t wanted filmed. It was still early evening, light enough to see, and he made his way down the backstreet snapping his fingers in an unconscious, agitated movement. _ _ Not too shabs, right? I’m using this factoid about me as some sort of loose metaphor for the stage of life that I’m in—I have areas of interest that are coming into focus, but as far as a long term plan, things are still painfully unresolved. Cooking remains my one constant, and despite my quest for a career being complicated at times, this recipe couldn’t be simpler. 1. Toss the tomatoes, garlic, torn basil, oregano and olive oil in a small mixing bowl. I don’t really like pepper so I didn’t add any to mine, but taste it and add seasoning if you feel it needs it. 2. 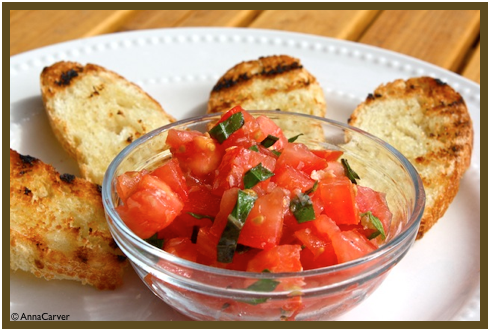 Serve the bruschetta on grilled slices of bread and you can also top it with some grated parmesan.